With a billion (yes, billion) users, Facebook is still the mightiest social media platform for business promotion. 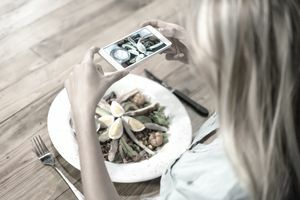 Restaurants can use Facebook to connect with customers and increase sales through many different ways including video streaming, photos, and list building. Social media is all about making people feel special and connected with your business. You want them to like you, trust you and most importantly—buy your products or service. For a restaurant, effectively using Facebook and its newer features like live streaming and photo editing can help build a strong online brand which in turn will attract customers and ultimately increase sales. Facebook can also help drive traffic to a restaurant's website, where customers can do things like make reservations, buy merchandise or learn about other services the restaurant offers, such as catering or delivery. One of the biggest advantages of social media is that its low cost. Note that I didn't say it's free because it isn't. It still requires time—either yours or someone else on our staff. As a restaurant owner, your time is your most valuable commodity. It's important that however you opt to spend your time, it's growing your business one way or another. To help you make the most of your time and build a successful online presence, I've put together five ways that a restaurant can leverage Facebook to build its business. Facebook Live is a newer addition that allows users to stream live video right on their Facebook page. Inspired by now-obsolete sites like Periscope, Facebook Live is a savvy marketing tool for small business owners. The possibilities for restaurants specifically include cooking demonstrations, virtual tours of the dining room, meet the staff, live stream of events and other promotions. You can live stream your sous chef making one of his signature dishes. Or how about your best bartender showing how to mix the perfect martini? Live stream your St. Patrick’s Day celebration or New Year’s Eve bash, to show how fun and inviting your restaurant is. Videos are the ultimate 'show, don't tell' advertisement. Taking a cue from Instagram, another newer feature of Facebook is the photo editor. Users can upload photos directly from their phone and edit them right in Facebook. It features the ability to crop photos, add filters, stickers, text, and doodles. You can take photos of food pop, add funny quotes to photos of staff, or make your own restaurant memes. Sharing fun, interesting and entertaining photos is an easy way to keep your audience engaged. Photos are essential for successful Facebook marketing. People simply do not read posts that don't have photos attached to them. Every Facebook post you publish should have a good quality photo included. To help build a library of easily accessible photos, start taking pictures now. You can also ask your restaurant staff to take photos and send them to you. This includes lunch and dinner specials, drinks specials, photos of your dining room or bar, pictures of your sign, outdoor eating areas, etc... Organize these photos in Dropbox or Google Drive so that you can grab and go. By having a library of photos you (or your designated social media person) can write up posts in batches and schedule them over the next week or two. Any digital media expert will tell you it's all about your list. Establishing an email list is one of the best ways to market directly to your customers. Offering a signup button (also known as a call-to-action) on your business Facebook Page encourages customers to sign up for your newsletter or discount club, or whatever promotion you decide on. For example, Olive Garden's call-to-action on their Facebook page takes you to a landing page for their newsletter sign up, where they promise you that by signing up you'll be the first to know about upcoming menu specials. Even if you don't have an email newsletter set up yet, you can still start collecting emails. MailChimp offers a free email service that is easy to integrate with websites and Facebook. Social media is all about conversations. You want your customers talking about your restaurant and sharing good stories about their experiences dining with your staff. In every Facebook post, ask customers to do something or share something. For example, if you post a photo of your newest sandwich special, you can ask your customers something like "What's your favorite type of sandwich?" or even simply "White or wheat?" People love to feel included in the conversation and they love to share their opinion. But unless you ask them the question, they won't say anything. Want to customers to get to know your restaurant and all that it has to offer? Creating an effective website allows you a place to show off your business, away from the hustle and bustle of places like Facebook or Instagram—where there is a lot of competition and noise. Encourage your customers to click on a link on Facebook that brings them to your website. Once they arrive at your website they can see things like photos of your dining room, calendar of events, a downloadable menu. They could make reservations, buy gift cards online or other restaurant merchandise. Remember, your website should be more than just a contact page. Social media marketing can be overwhelming, especially if you are trying to run a busy restaurant. People often ask me where should they start? Twitter? YouTube? Pinterest? Instagram? While all of these platforms can help build a strong digital brand, Facebook can be a one-stop shop for the busy restaurant owner. After all, it's better to do just one thing really well than several things poorly.